Hey… someone get on 7.200 mHz and clear out some of those fowl mouth CBer want to be HAMs. I got this location on the map 50°24’00.0″N 4°15’00.0″E a location in Belgium. After a little hunting I saw the shadow of this rather large Antenna in at this exact location, 50°22’55.1″N 4°14’31.4″E , only for the shadow it would be rather difficult to find and the antenna is large. So what do people reckon , is this the signal I hear on the 120 Meter SW “commercial” band of 2381 Khz ? This signal has been broadcasting for a long time and should it really be in the commercial band like so many other signals ? This could be useful for hunting down these unwanted signals in the broadcast bands. If this is the signal from this transmitter then I must say that I’m bloody well impressed !!! Hi Mark. That signal at 2381.4 is STANAG 4285, a well-known milcom data transmission format. 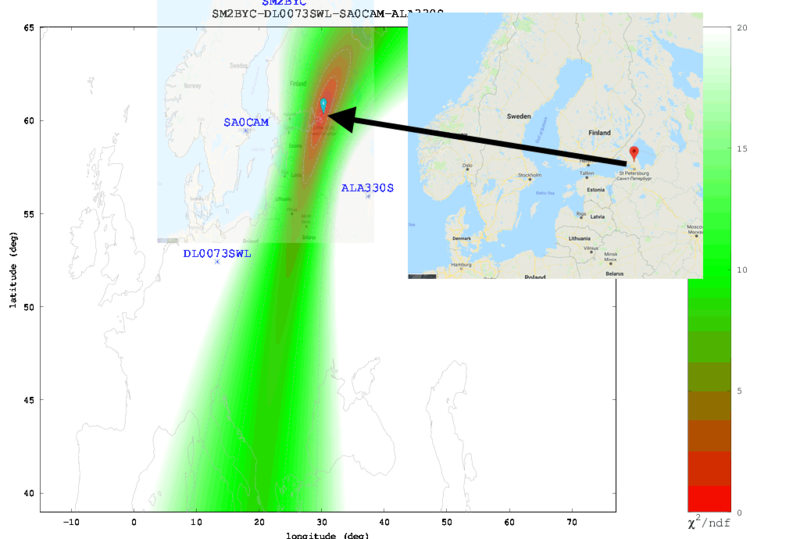 The antenna you found is identified on Wikimapia as a TV/FM broadcast tower: http://wikimapia.org/#lang=en&lat=50.381972&lon=4.242056&z=19 If you click on the antenna image the annotation overlay will take you to a website with all the details and good photos of the antenna. I don’t think it’s very likely that commercial V/UHF and milcom HF transmission would occur from the same facility. But who knows. STANAG signals have been traced previously by others via TDoA to this location in The Netherlands: http://wikimapia.org/#lang=en&lat=51.807381&lon=3.893023&z=16&m=b Probably Dutch Navy and/or NATO. When I used the Kiwis F1JEK, DF0KL and M0TAZ during daylight when the signal had no fading I got a location within 20 km of there. So that would be my guess. Does commercial broadcast have exclusive use of the 120 m band in the EU? It could be that STANAG is there because the band has shared allocation. Thanks for the WiKi link, it will be very useful. 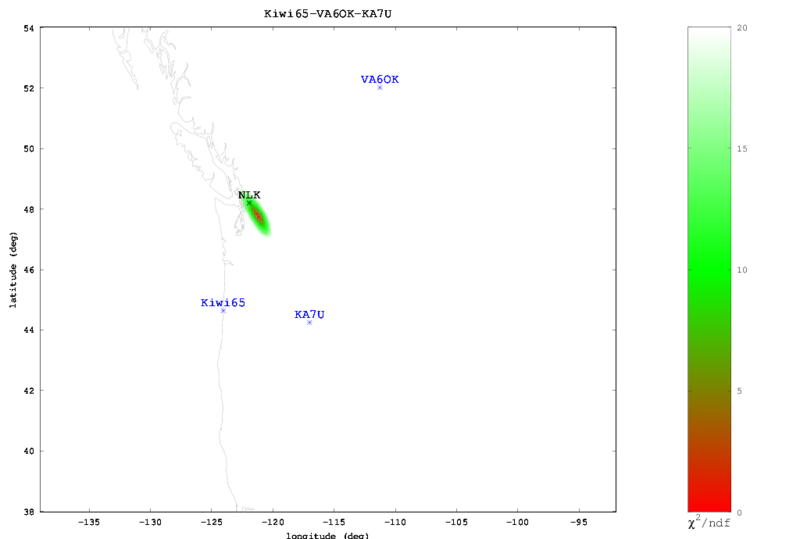 The displayed “most likely position” lat/lon marker is a bit deceiving in some cases. You really have to evaluate the quality of the TDoA solution to decide if the MLP marker is useful or not. Sure, if you get a heat map where the red/green area and contour lines are contained in a small space then you can be pretty confident in the solution. Great work. Congratulations. Even my thesis work aims at “Detection of HF radio transmitters using passive geolocation techniques.” We have a receiver network (4 receivers) deployed across France capable of synchronously capturing signals from the HF band. 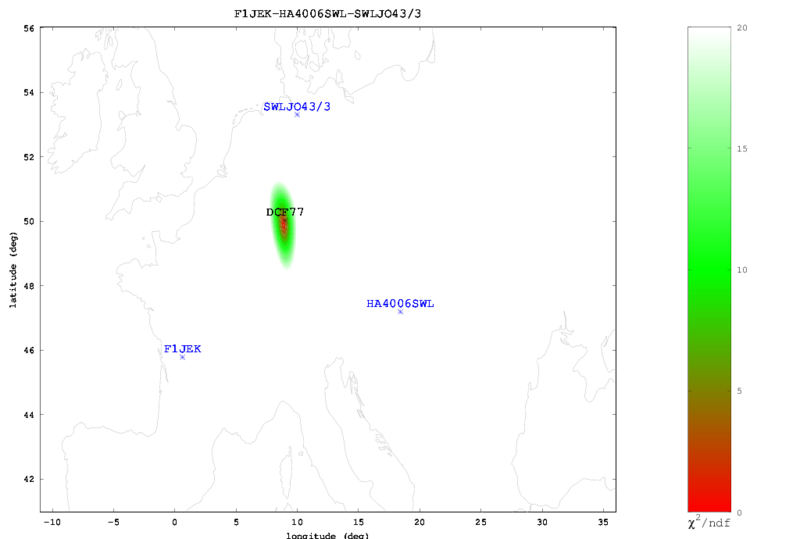 From our experimental campaign we could observe that HF geolocation could be achieved using the TDoA method. The captured signals were actually broadcast signals and thus their properties were completely unknown, still we could locate the Tx with an error of about 5 km in some cases. We captured signals from HF broadcasters which fall within the range of one-hop propagation from the receivers. 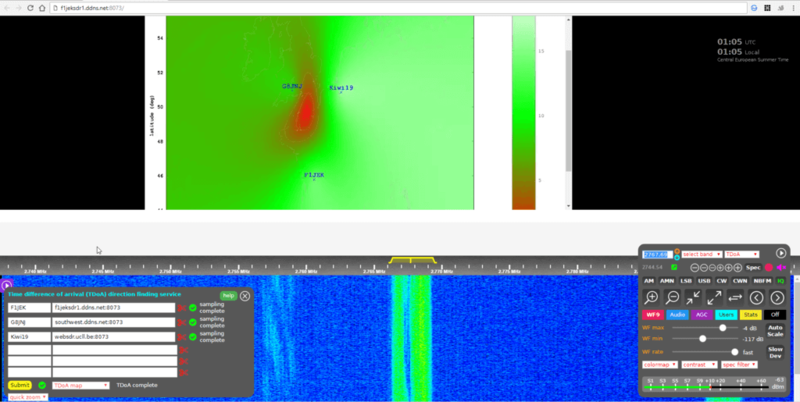 I would like to know if you had information about the signal type you received using the SDR modules and how the obtained TDoA was translated to obtain the ground range? Did you use the ionospheric profile to obtain the reflection height? I will wait for your reply. If it’s okay, maybe we can have a discussion through skype? Note the article say NLK on 24.6 kHz. The actual frequency is 24.8 kHz. Kiwis running the latest software release (>= v1.204) now plot the TDoA output onto a Google map instead of the “coastline” maps you see above. This allows you to immediately zoom-in after a TDoA run and start looking for any possible transmitter/antenna site. I am blown away by this. Could a downconvertor be used so that VHF and UHF stations can be located? Would it be sufficient to phase lock the LO with GPS derived 10 MHZ clock? I would like to see some local stations with TDOA capability at VHF and above. They are not on sdr.hu at the moment, but in the past we had a couple of Kiwis using 6 and 2m downconverters. The Kiwi supports re-mapping the frequency scale and entry to allow this. I don’t know if the current TDoA would work in this case or not. Locking the converter LO to GPS may not even be required as long as short-term drift/jitter is not significant over the 30 second TDoA sampling period. You don’t really care about the frequency accuracy. It only matters that the precise time is known as samples are recorded. A most fascinating and useful technology. I wonder if this might have applications in the field of search and rescue? Say for example you have a missing hiker in a vast wilderness area. The hiker was known to be carrying a cellphone, but there is no cell reception in the area. If his phone is turned on, even with no base station nearby to connect to, it will still periodically send out signals and wait for a response from a cell base station. Most if not all modern cellphones communicate over frequencies above 2 GHz but unlike atmospheric bounce signals they are not terribly powerful and designed to be strictly short range communications, so perhaps several mobile KiwiSDR’s could be deployed around the periphery of the area the hiker is believed to be lost in and the computers running a program that automatically links to the other KiwiSDRs in the search and listens for these periodic signals and calculates a likely position when one is received. The same idea could be useful for locating downed aircraft, missing ships at sea, locating tagged pets or wildlife, finding lost persons with transmitting devices other than cellphones (FRS/GMRS radios, PLBs, EPIRBs etc…). KiwiSDR covers 0 to 30 MHz, so what you’ve suggested might work if the hiker happened to have a phone that works in that range. I think (or at least hope) that search and rescue teams use some some kind of radio based direction finding when they are trying to find a person who is likely to have a transmitter on them. However most phones work on similar frequencies so it’s hard to tell whether you just located a member of your team or the person you’re looking for. You made the assumption that it’s the radiated power that is the limiting factor “they are not terribly powerful and designed to be strictly short range communications”. Cell phone bands vary with region, but start around 900 MHz. At such high frequencies we are limited to Radio Line Of Sight (RLOS) coverage or D (km) = 4.13 (squareroot of transmitt station [m] + squareroot of transmitt station [m]) under normal propagation conditions. The optical LOS is slightly smaller and you have to replace the 4.13 by 3.52 to calculate it. Increasing the Effective Radiated Power, either by increasing transmitter output power into the antenna or increasing antenna gain, doesn’t help. 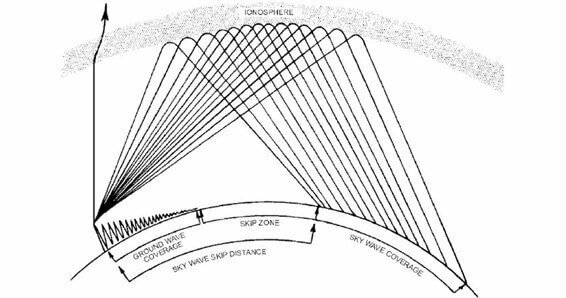 RLOS is thelimiting factor, other wise Secondary Surveillance Radar with antenna gains of about 27 dBi should not be limited by RLOS. For the same reason even highflying aircraft cannot be interrogated after a few hundred NM varying with FL. Kiwi SDR isn’t going to DF “any” freq between 0-30 MHz. No matter how many stations you have you cannot DF NVIS. Very cool though. NVIS covers a wide range of distances, out to perhaps 400 miles. I have had luck with using the scheme to look stations at the further reaches of NVIS. Absolutely amazing, especially the part with number stations. For many years they’ve been impossible to locate for most people and now it’s not only possible, but so easy that almost anybody can do that! Definitely would like to see a Massdrop soon. Last drop seemed to sell-out within two days (the drop offering period is normally 7 days). The drop terms specify “limited quantities” but they don’t say how many. Last time we worked out it was about a dozen. So you have to work a bit to get your $100 discount. I think they have all these limitations because they sell so far under MSRP. I am happy to see that my station, carefully tuned and installed in my parent’s house to be free from computers EM noise, has been taken for the demo. We’re making improvements to the TDoA extension almost every day. Top priority is to plot the results on a zoomable Google map overlay instead of the current “coastline” map. 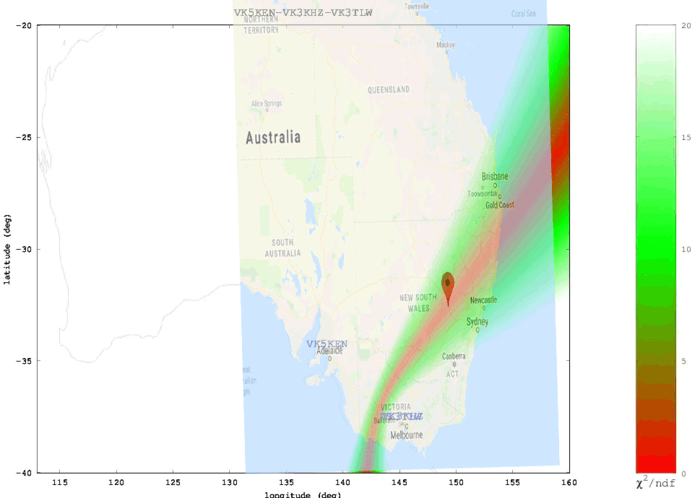 Essentially like what you see above for the Aussie MW station. This will make it much more convenient once you have a TDoA solution to zoom into the Google satellite map and begin hunting for the antenna field. Already there have been some interesting discoveries.